It is time for another S.O.A.P. devotional. S.O.A.P. 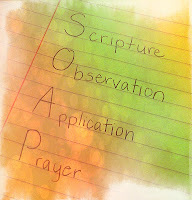 stands for Scripture, Observation, Application, and Prayer. If you want an explanation for these sections, please read my first SOAP post. God blesses us, so we should bless each other, but not necessarily in words, but in actions. If God is smiling on us, we should smile on the world. If God is gracious to us, we should be gracious to others. If God forgives us, we should forgive others as well. If we have God's love in our heart and we work at being like Jesus Christ, we are bound to do amazing things during our lifetime. We may not solve world hunger, but we can make a difference in people's lives by living like Christ and bringing his blessing on those around us. Dearest God, Thank you for blessing my life so many times over. You have brought me family and friends who help me to walk in Your path and help me to bless the world with the gifts You have given me. Help me to see the opportunities to share Your blessing on the world. I pray that my short walk on this world can be filled with Your blessings for others. May my mouth be filled with Your words, may my heart be filled with Your love, may my actions be Your actions, and may I see You in every corner of my life. Amen.